Number 22 on the Burleigh map, this location housed a bank chartered by David A. and Simon W. McDonald, the latter also running an insurance business in the same building. David was primarily a miller, who during the 1880s ran the Genesee County Flour Mills in Batavia, NY. Simon, who for a time had worked at Page's Mill in Mumford, NY, concentrated primarily upon banking. 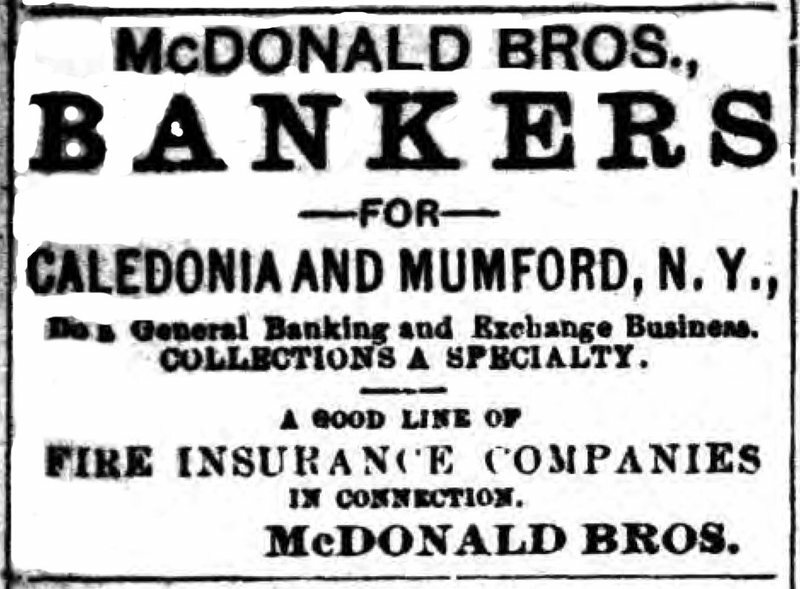 Sometime around 1900, McDonald Bros. Bank became First National Band with an expanded board of directors. Caledonia Advertiser, 14 Jan. 1892. Courtesy of Tom Tryniski / Fulton History. “McDonald Bros., Bankers,” OpenValley, accessed April 25, 2019, https://openvalley.org/items/show/781.